Agni-V is a three stage missile, 17 metres tall, two metres wide and capable of carrying 1.5 tonne of nuclear warheads. Agni-5 is the most-advanced in terms of navigation and guidance, warhead and engine. India successfully test-fired nuclear-capable ballistic missile Agni-5, which has a strike range of 5,000 km, from Dr Abdul Kalam Island off the Odisha coast today. This is the seventh trial of the indigenously-developed surface-to-surface missile, defence sources said. Unlike other missiles of the series, Agni-5 is the most-advanced in terms of navigation and guidance, warhead and engine, according to officials. 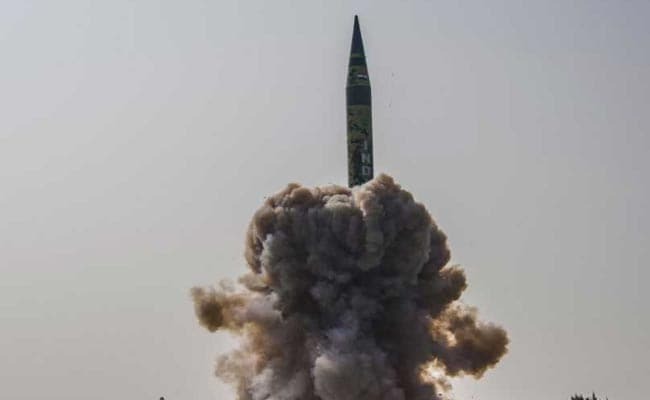 "The missile was launched with the help of a mobile launcher from launch pad-4 of the Integrated Test Range (ITR) at Dr Abdul Kalam Island in the Bay of Bengal on Monday afternoon," said a defence source. "It was a user associated trial and strategic force command with DRDO scientist conducted it," they said. The missile has been designed to hit the designated target point accurately, guided by the on-board computer with the support of a Ring Laser Gyro-based Inertial Navigation System, the Micro Inertial Navigation System, fully-digital control system and advanced compact avionics, as per DRDO officials. The first two flights of Agni-5 in 2012 and 2013 were in open configuration. The third, fourth and fifth launches were from canister integrated with a mobile launcher, in its deliverable configuration to enable launch of the missile with a very short preparation time as compared to an open launch. The sixth trial was in June during which the missile was fired from a mobile launcher. Several new technologies were successfully tested during the sixth trial. The Agni-5 also has advantages of higher reliability, longer shelf life, less maintenance and enhanced mobility, according to sources.